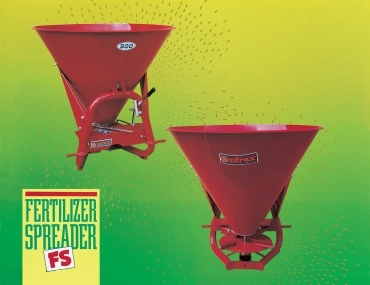 All our fertilizer spreaders are made of high-quality materials. They are degreased, then painted with antirust and finally coated with anticorrosive paint dried at 120°C. Also suitable for spreading rice, wheat, and many other cereals, as well as for salt and sand on icy roads. Supplied on request. Suitable for spreading of powder fertilizers. Easy and rapid to fit. Adjustable spinner fins on all our fertilizer spreaders, duly designed to give maximum spreading accuracy and uniformity. Average output per hour: 3/6 Ha. Fertilizer spreading quantity: adjustable from 20 up to 3700 Kg/Ha. Working speed: 3/16 Km/h with P.T.O. at 540 RPM. Hopper Capacity 144 Litre - 38 Usa Gal. Hopper Capacity 250 Litre - 66 Usa Gal. Hopper Capacity 338 Litre - 89,5 Usa Gal.